HARRISBURG, Pa. — Choking back tears, local processed meat lovers outside Pennsylvania’s capital bid farewell to an old friend — the local Oscar Meyer Wienermobile. 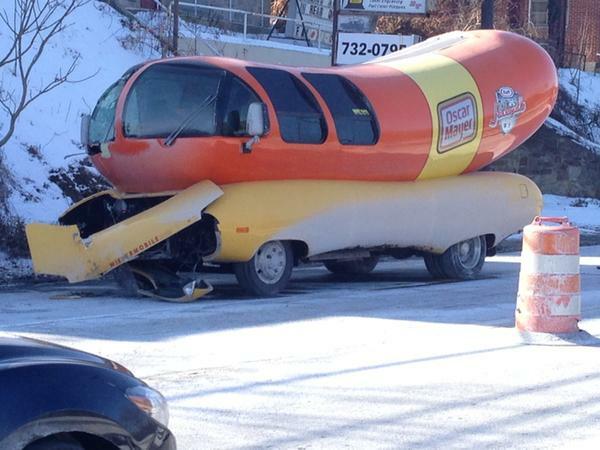 The Wienermobile crashed outside a popular local deli on Sunday afternoon, just after lunchtime. Efforts to revive the Wienermobile failed, and local mechanics reported the vehicle dead on the scene. Traffic was clogged for miles on one of the city’s main arteries as crews worked feverishly to clear out the blockage. No injuries were reported in the crash, which occurred after veteran Wienermobile driver Roger Krasinski, driving alone, lost control of the vehicle while grilling a variety of hot dogs, bratwurst and other sausages over the passenger seat. Krasinski told police that the Wienermobile’s state-of-the-art ventilation system was overwhelmed with grease and microscopic sausage particles, causing the cabin to fill with a wonderful, sweetly aromatic smoke. The smoke blocked Krasinski’s vision and caused him to slam into a telephone pole, which he reported looking remarkably like a summer sausage.